Researchers have made an incredible discovery. The Earth’s outer atmosphere extends much further than expected, stretching to 630,000 kilometers (391 000 miles), which is roughly 50 times the diameter of our planet. Obviously, you cannot breath there as the atmosphere becomes more tenuous the further from Earth’s surface you are, but this finding has important implications for space travel and space observatories. The findings, reported in the Journal of Geophysical Research: Space Physics, were possible thanks to decades of observation from the ESA/NASA Solar and Heliospheric Observatory (SOHO). The observations were actually made decades ago, and can only be done at certain times of the year. The data showed that the Earth’s exosphere is slightly denser than interplanetary space for a significant distance. At the Moon distance, on average 384,000 kilometers (239,000 miles) away, there are only 0.2 atoms per cubic centimeter. At 60,000 kilometers (37,000 miles) from Earth, there are still 70 hydrogen atoms per cubic centimeter and the density only drops down to less than 1 atom per cubic centimeters at over four times that distance. Despite the low density, the hydrogen interacts with sunlight, ultraviolet rays in particular. This emission is what allowed researchers to study the so-called geocorona. This UV glow or the presence of this diluted hydrogen poses no threats to future astronauts on missions around the Moon, but it will need to be taken into account if we use near-lunar observatories. 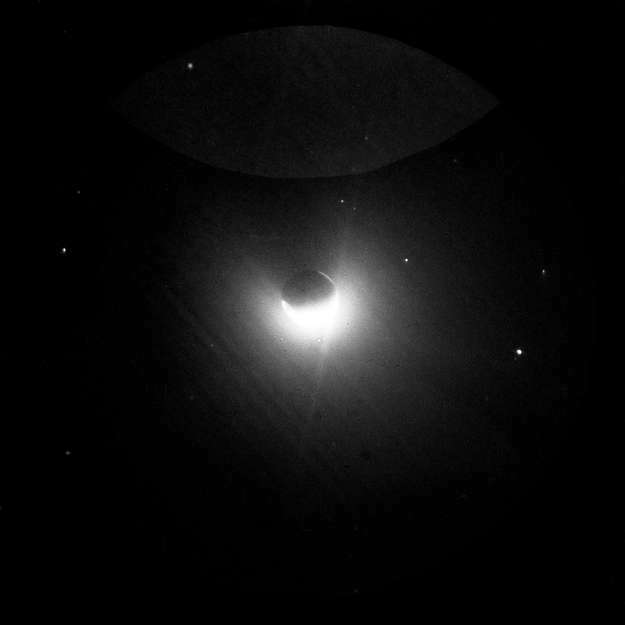 Apollo 16 astronauts used the first telescope on the Moon in 1972 and unknowingly took the first picture of the geocorona. “At that time, the astronauts on the lunar surface did not know that they were actually embedded in the outskirts of the geocorona,” explained Jean-Loup Bertaux, co-author and former principal investigator of SWAN, the instrument used by SOHO to detect the geocorona. The finding might have important consequences for exoplanet research, too. A UV glow from hydrogen in a planet’s exosphere suggests the presence of water vapor closer to the surface. This is the case for Venus, Earth, and Mars. Detecting this signature around a planet in another star system can tell us about a potential water reservoir there.